Home » Daily Life , Digestive Health , Food Tips » Acidity and Antacids are making you Unhealthy ! Acidity and Antacids are making you Unhealthy ! 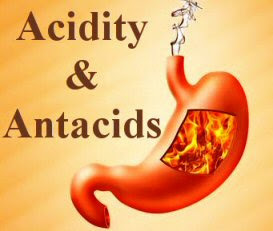 Most of the pharmaceutical companies advertise for their antacids and make people believe that acids in stomach are harmful for you, as if their is an acid attack occurring on your stomach and you should neutralize it as soon as possible. But the truth is much different from whats advertised. Reality is that antacids are making your sick and their side effects are causing numerous diseases. Here betterhealthfacts.com will bring much researched information from internet on the topic of Antacids and tell you why you should keep yourself away from using unnecessary antacids. Antacids are a class of medicines meant to neutralize the acid in your stomach. They are meant to give you relief from heartburn, indigestion or stomach upset. When excess amount of acid is produced in stomach then it can damage the lining of stomach. Antacids contain alkaline ions which can chemically neutralize the gastric acid of stomach and thus reduces the damage and gives relief from pain. There are various brands of antacids with different elements in them. Most commonly used elements are magnesium, calcium or aluminium. Why do our stomach generate acids and how it works? Gastric Juice produced in stomach usually consist of hydrochloric acid (HCl), potassium chloride (KCl) and sodium chloride (NaCl). Acids in our stomach help in digestion of food. Various nutrients from the food can't be extracted out of the food if there is no acid in stomach. Gastric Acid secretion can start only if we wish to eat something. Smell and Taste of food are other major activities to start secretion. 30% of total gastric acid is secreted by these activities. 50% of the gastric acid is released by amino acids present in the food that we just ate. Here are a few function of stomach acids. Acid in Stomach kill various disease causing bacteria that comes in with the food. HCL in stomach converts the inactive enzyme pepsinogen into the active enzyme pepsin which helps in digestion of proteins. Is there any internal mechanism in stomach to fight acidity ? Gastric Juice (or so called stomach acid) is produced by cells in lining of stomach known as parietal cells (also called oxyntic cells) and its production can be increased depending on the usage. The pH of the gastric acid produced in our stomach is 1.5 to 3.5. Some other stomach cell release bicarbonate, a base, to neutralize acid to save you from the excess acidic environment. Mucus is produced by some cells to protect your internal stomach skin from acid. Cells in the beginning of small intestine produce large amount of bicarbonate to completely neutralize the gastric acid. All these mechanisms are sufficient to save you from the extra acid produced by your stomach. Why do people suffer from Acidity ? Mostly eating processed or cooked food. Alcohol, coffee, tea and high sugar foods can double the production of acids in stomach. Taking over-the-counter antacids without and prescription makes the condition more severe. What are the side effects of Antacids ? Antacids don't actually solve the problem but just suppress the symptoms. The acid when was meant to digest the undigested and enzyme-less food was neutralized by antacids. It can easily lead to gas, bloating, bad digestion. Acid blocking drugs can cause Nutrient deficiency. Iron and Zinc deficiency and easily occur if you are taking antacids on regular basis. Vitamin B12 also needs a good acid level in stomach for proper absorption. Some antacids contain sodium, which is not suitable for people on a sodium restricted diet. Nutrient deficiency can easily result in some other diseases and doctor will recommend more medicines and thus more side effects and the chain continues. Antacids are different from acid-reducing drugs. Antacids can't kill the bacteria Helicobacter pylori, which is responsible for most of the ulcers. Eno is the oldest antacid brand marketed by James Crossley Eno which dates back to 1852. Main components of Eno were sodium bicarbonate, sodium carbonate, and citric acid. It is also used as baking powder. The pH of the gastric acid produced in our stomach is 1.5 to 3.5. Lowest pH can be up to 0.8 but stomach lumen dilutes it to remain between 1 and 3. An adult human stomach can secrete 1.5 liters of gastric acid per day. Gastric Acid concentration in stomach can reach up to 3 million times of concentration in Arterial Blood. What should i do if i feel acids in my stomach ? If the condition is not severe then try changing your lifestyle and eating habits as told above. You may try some herbal treatment for acidity for a few days. If the condition is severe then instead of being your own doctor, visit a doctor and get the prescribed medicine for correct duration.